Royal Thai Airlines Amalgamated request tenders for purchase to modernize its passenger airliner fleet. 1. Need for small airliner 8-15 passengers, range at least 1000 kilometers. Purchase order will be 20 aircraft with additional aircraft as needed. 2. Need for medium airliner 30-40 passengers, range at least 2000 kilometers, service ceiling must be at least 5700 meters. Initial order is 20 aircraft with follow up orders as needed. 30-40 passengers is a LARGE airliner for the 1930s, given that the DC-3 only carried at most 32 passengers. The DC-4 carried 52, but was uneconomical in service. I have an airliner in mind. 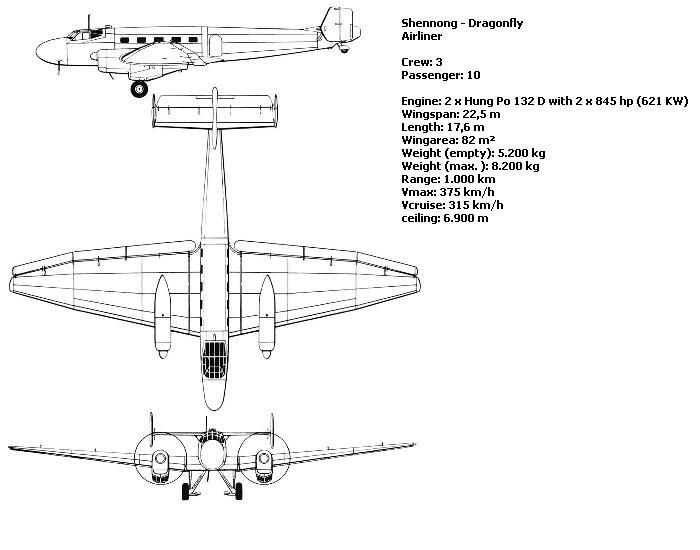 Does Siam actually have enough air traffic to merit anything larger than a DH Dragon Rapide could provide? Thailand will be negotiating with Eurasian Aviation for commercial traffic rights in China That requires some airliners. There is already an agreement to establish White Crane Class Zeppelin routes to Chungking and Shanghai. There will be other routes established. 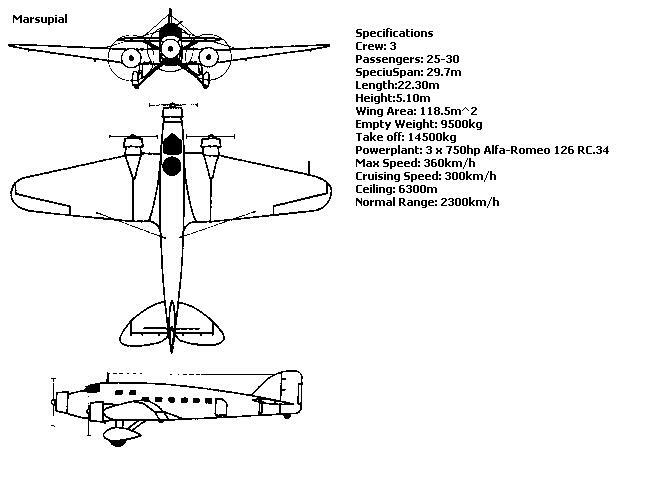 I doubt the Ju-90 was that much more efficient as an airliner than the DC-4 was (though the BMW-132 would be cheaper to run than the P&W R-2000, just because it's a smaller engine) , but Junkers has built the Ju-90 in very small numbers, and if Siam wants some all they need do is contact Junkers. Currently, Junkers is building a variant of the Ju-90, the Ju-90S, for demonstration to the Luftwaffe as a possible heavy bomber. This plane, after being shown at the Hendon Review, is awaiting re-engining with BMW-801s replacing it's BMW-139s. 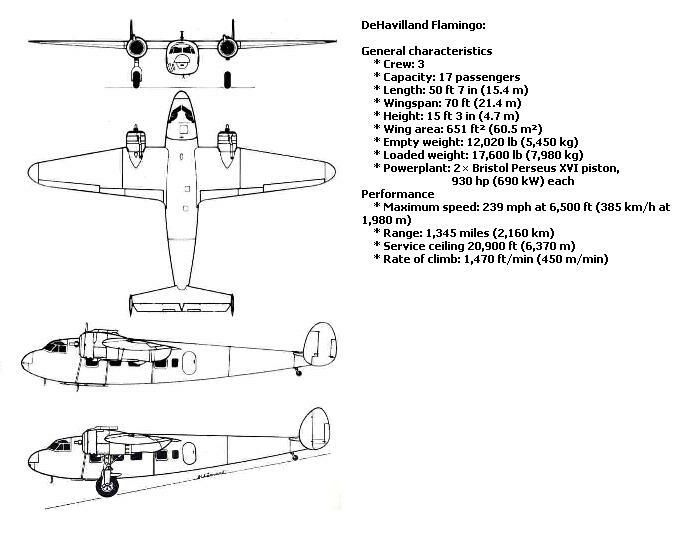 As far as the request for a smaller aircraft goes, Junkers can offer the Ju-52 (rugged, absolutely reliable, and cheap). De Havilland D.H.91 Albatross; designed as a transatlantic mailplane to Specification 36/33 the first prototype of this sleek monocoque wooden aircraft first flew on 20 May 1935. Fourteen are on order for Imperial Airways, six as D.H.91 mailplanes and the remaining eight as 22 passenger airliners for European routes. QUANTAS brought two and Persia received eight in 1936. 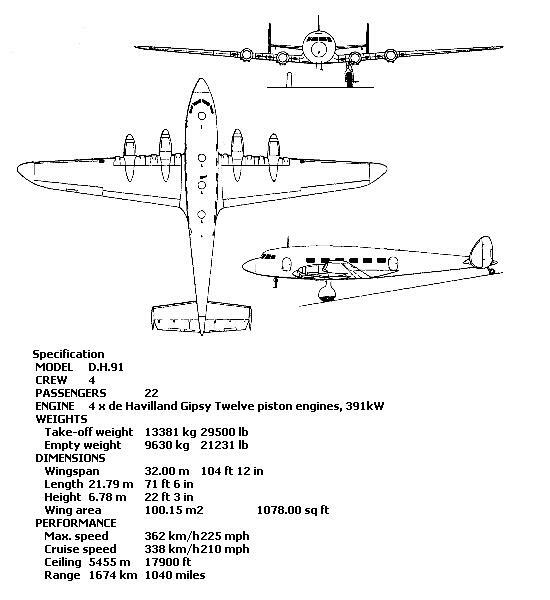 Dimensions; 105/ 71.6/ 22.3/ 1,078 sq ft; 4x 525hp de Havilland Gipsy Twelve; max speed 225mph; range 1,040 miles and service ceiling 17,900ft. On the drawing boards at Hatfield is the De Havilland D.H.95 Flamingo; this private venture design that will fly in December 1937. This all-metal high-wing airliner will carry 17 passengers and a crew of three/ four. Designed for economical operation it is capable of operation from rough strips with limited facilities. Dimensions; 70/ 51.7/ 15.3/ 651 sq ft; 2x 930hp Bristol Perseus XVI; max speed 243mph; range 1,345 miles and service ceiling 20,900ft. China offers for the Shennong Dragonfly for the small airliner request. The Savoia-Marchetti SM.75 nicely meets the spec as is readily available at the current time. The picture above shows one of the aircraft in service with Ala Littoria. Last year one of these aircraft took part in a famous Atlantic crossing flown by Italo Balbo. A very reliable machine with good handling characteristics and a short take off. A larger version with increased passenger carriage is currently under design to be powered by Alfa-Romeo 135 engines. Initial order for 10 aircraft signed with DH-Siam to be licensed manufactured at the DH-Siam facilities. Development order with DH-Britain signed for license manufacture by DH Siam as soon as development is complete. Aztcarte and BAM enter into development contract for future joint manufacture. 10 Shennang Dragonfly purchased COTS as an RTAA internal service hub airliner to cement improving relations between China and Thailand, and to ensure closer ties between Eurasia Aviation and RTAA. 10 Marsupial B purchased as COTS aircraft for internal hub service aircraft. 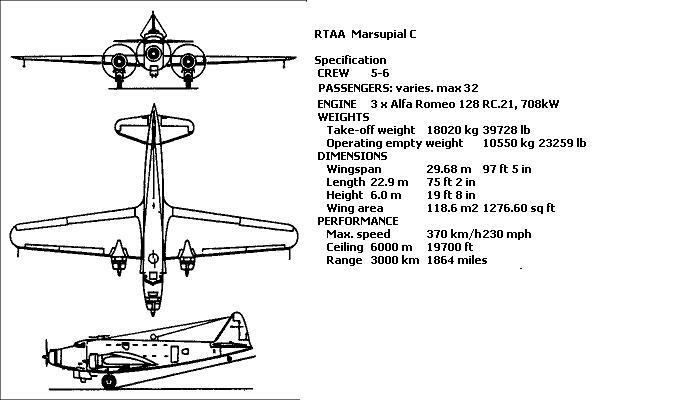 10 Marsupial C aircraft purchased for overseas routes. This is the RTAA modernization program as passed by the NCP dominated Assembly and signed into law by the king.